The calendar will be displayed on an LED screen, believed to be the biggest in Europe, at Marble Arch linking the retail district of Oxford Street with Winter Wonderland in Hyde Park. The aim is to add to the existing festive illuminations across the city and extend the Christmas cheer of the West End even wider. The screen will display a festive countdown to Christmas. Cllr Robert Davis, deputy leader of Westminster City Council, said: “Westminster loves Christmas – and the millions of people that come to the city do as well. 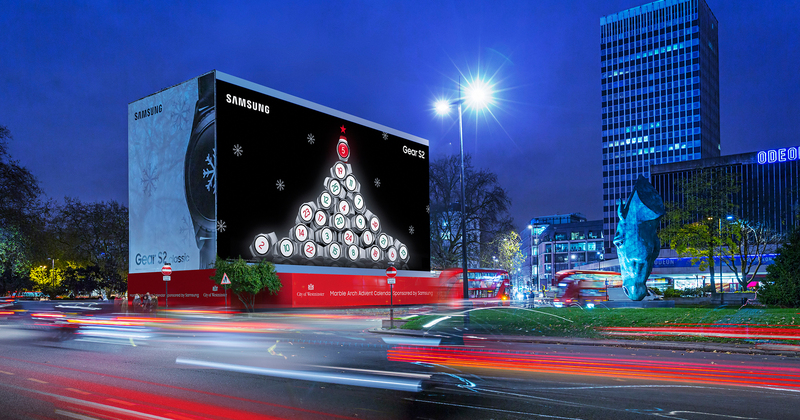 “We have fairs in Leicester Square, lights on Oxford Street and our world-famous Norwegian Spruce in Trafalgar Square – so we wanted to extend the festive cheer even further by hosting an advent calendar at Marble Arch. It is an exciting project and we hope residents, businesses and visitors enjoy the display. Wildstone, the outdoor advertising consultants behind the design and build of the project are appointed by Westminster City Council. Previous festive schemes they have developed include the Eros Snow Globe and Piccadilly Presents. The advent calendar will run from December 1 until January 1 2016 and will display a New Year countdown following the Christmas Countdown.